I have always wanted to paint this Fusilier Regiment as it is one of the most colourful in the Prussian army. 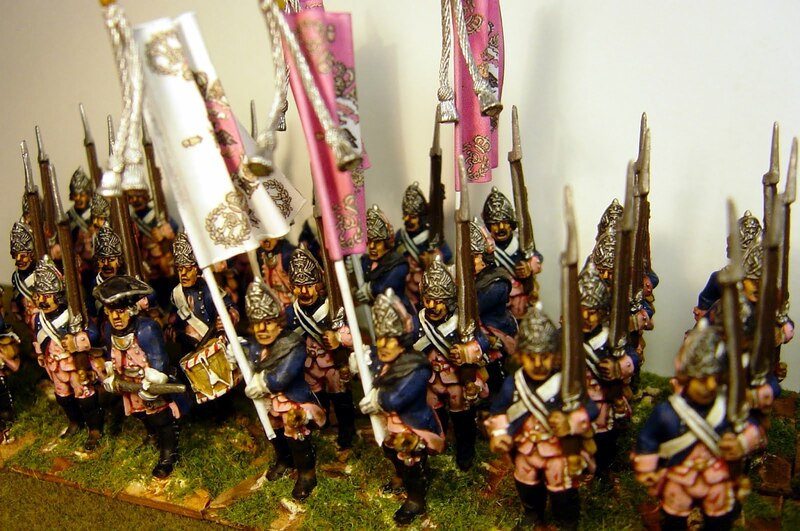 Three regiments in the Prussian army used pink as a facing colour - this one, 40, and Musketeer Regiments 7 and 18, but 40 was the only one with pink trousers as well. The figures are all Crusader but the sharp-eyed amongst you will spot two Foundry chaps lurking in the ranks. 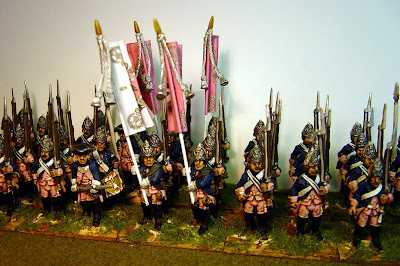 When building a Prussian army of the SYW one needs to consider ratios of various types of infantry. 1) There were 33 Musketeer Regiments of two battalions (actually No 3. had 3, No. 6 had one and No.15 had 3) making a total of 67 battalions. 2) There were 16 Fusilier Regiments of two battalions making a total of 32 battalions. 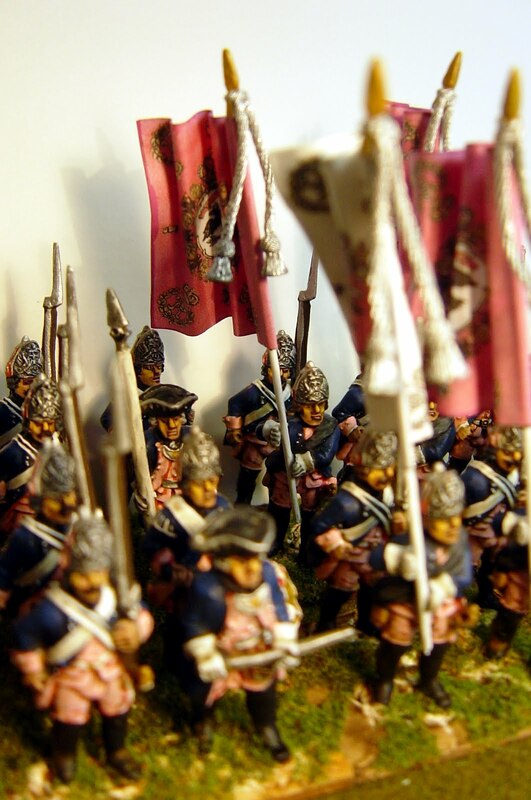 3) There were 23 Converged Grenadier battalions. 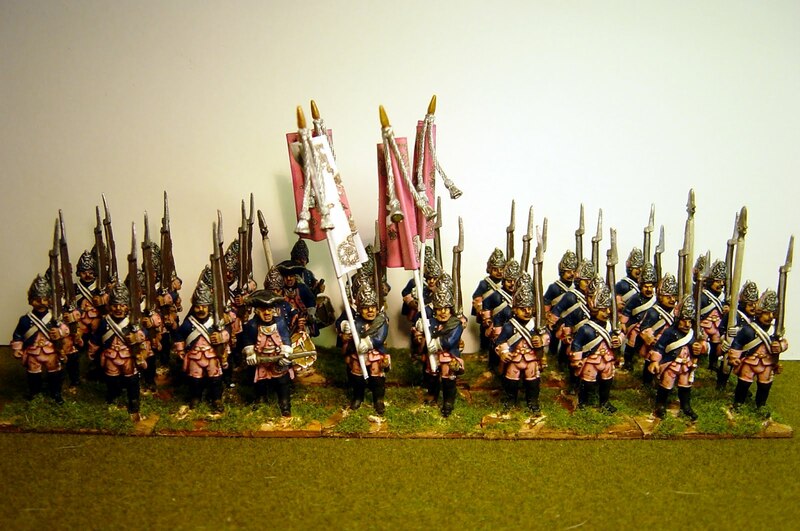 4) There were six Standing Grenadier battalions from garrison troops. 5) There were 10 regiments of Fusiliers (each of 2 battalions) made from Saxons captured at Pirna. 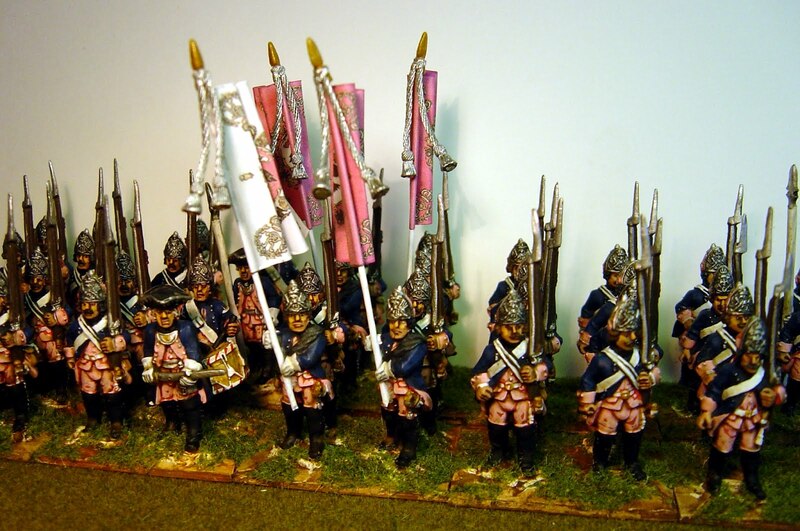 6) There were 5 battalions of Converged Grenadiers from the new Saxon Regiments. Frederick, when making up his own army, tended to pinch the best troops for himself - the best Musketeer regiments and many of the Grenadier battalions. He would leave the rest to other commanders looking after other fronts - like Prince Henry in the west watching the French and Reichsarmee or General Lehwaldt watching the Russians in the East. Do you make up a Frederickan army of good quality or do you make up a far less capable army as might have been commanded by another General? Most people do the former, but it would be an interesting experiment to have an army with a number of Saxon Fusilier regiments as, in reality, these ran away at the first chance. The choice is yours but I suggest that an army commanded by any General other than Frederick II will prove to be a greater challenge to command. Prince Henry was, in many respects, a better commander than his elder brother - he was more caring of the conditions of his soldiers and he was less prone to taking extreme risks. He also had worse troops under his command so his achievements were perhaps the greater. This is just a plea to consider other options besides the obvious army commanded by Frederick II. These guys really look fantastic. Congratulations.